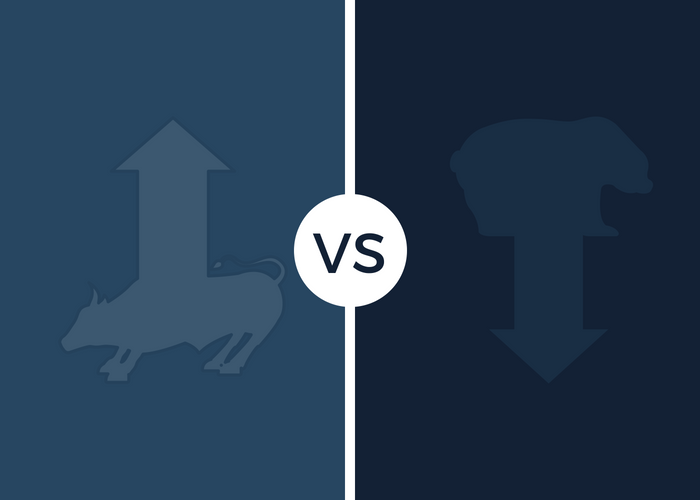 Bullish vs Bearish: Are You a Bull or a Bear? We’ve all been there. Mid conversation with a co-worker or friend, and they throw in a word or two that leaves you scratching your head. This isn’t uncommon in the investing world, as words and terms that have one meaning in our everyday life, end up meaning something different in the context of the stock market. The terms bearish and bullish are a few of these terms. What does the term “bullish” mean? What does the term “bearish” mean? What qualifies as a bearish vs bullish market? How to make money in a bearish or bullish stock market. By the end of this article you’ll be ready and prepared to react to a bearish or bullish stock market, and also be prepared with a quick response the next time someone uses these terms. Bullish is a term used to describe an investor who believes that the price of a stock is going to go up. As you can probably guess, a bull market is used to describe the stock market when prices are rising over a sustained period of time. A bullish investor would generally be buying stocks with the belief that the price will rise over the long-term. Bullish investors often say they are “long” in a stock, referring to the expectation that they will make money on the stock as the price trends upwards. The origin of the term “bullish” comes from the act of a bull striking upward with its horns, which is correlated to the upward trend in the stock market. Inversely, the term bearish describes an investor who believes that the price of a stock will go down, and a bear market describes a stock market that is going down over a sustained period of time. A bearish investor would generally be selling their position in a stock with the belief that the price will fall over the long-term. The origin of the term “bearish” comes from the act of a bear striking down with its paws, which is correlated to the downward trend in the stock market. When does a market change from bearish to bullish? A bull or bear market doesn’t develop overnight. If the market is down one day, and it begins going up the next day, the daily fluctuation in market direction would not qualify as a bull or a bear market. The exact timing of when a market is classified as bullish vs bearish isn’t defined, but by tracking the market and studying trends in the market indices, you can begin to identify when a bull or bear market is developing. It is important to track these trends and fluctuations in the market to monitor investor sentiment, which can result in stock market momentum pushing a stock’s price down or up, without any changes to the intrinsic value of the stock. The only way to make money in the stock market is to buy a stock at a lower price, and sell it at a higher price. If I’m bearish on a stock, how can I make money trading the stock if I expect the price to fall? The answer has some complexities, but to get down to it - you can sell a stock at a high price and buy it back at a lower price. This is called shorting a stock. Let’s say a stock is trading at $10 per share and you sell 100 shares for $1,000. At this point, you would have negative 100 shares of the stock, which you would need to settle up within a certain time period. Let’s assume your bearish feeling was correct and the stock moves lower to $9 per share and you buy back the 100 shares for $900 to bring your account back to zero shares owned. When you sold the shares you received $1,000 and you paid $900 to buy them back at a lower price. The result is $100 of profit by short selling the stock! If your bearish feeling was wrong, and the price went up after you first sold the shares, you would have ended up being forced to buy back the shares at a higher price, which would result in losing money on the trade. Short selling can be difficult, and there is additional risks involved. If you buy $1,000 of stock, you know that even if the stock went to zero your maximum loss would be $1,000. But if you short a stock that is currently priced at $10 and it jumps to $30 before you buy back the shares, you could end up losing $20 per share! You can read up on short selling in more detail by checking out Investopedia’s explanation here. In the stock market game, the bears and the bulls are pulling in opposite directions. Being bearish vs bullish on a stock impacts your investing strategy and decision making, and ultimately dictates how you invest in a stock. You are now ready to talk the talk of a pro investor. Get out there and drop some knowledge on your friends and co-workers, and let them know if you’re bullish or bearish on the market. And if you’re looking to screen for stocks that fit your investing criteria, and assist in your valuation of a stock, be sure to check out our customizable stock screener.